A composite picture taken on another dramatically cloudy day. The new lamp on the right, at Thresher's, has been painted black and the painters are now lurking in the white van with the yellow hydraulic arm parked in front of the Stock Dove, gathering the strength to blacken the fancy-topped lamp on the left. At the previous weekend, our Trivial Democrat council handed out one tin of gold paint and the painters and added gold bands to the three lamps near the BP petrol station (the one in the centre of this picture and the two shown in picture 6 [section 2]). Two days later, on Friday, the Triv-Dems coughed up another tin of gold paint and the painters returned to apply more stripes and cause traffic jams on Compstall/Stockport Roads. Why did they have to cause traffic jams to paint gold bands on lamp posts? Because that's not the whole story. Each lamp post has an orb on top and these had to be painted gold as well as the bands, hence the need for the van with its hydraulic arm. 15. The first blue-sky day after Painting Day. 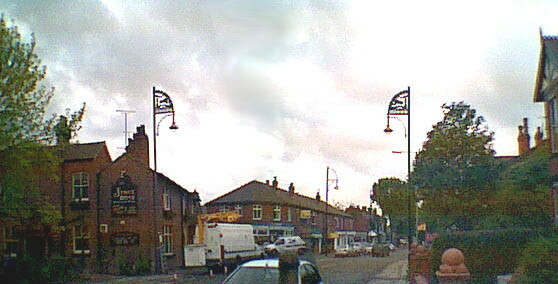 The painters have been and gone, the new lamp posts are now proudly black and gold, and the sun is shining on Romiley on a Bank Holiday Monday, which has to be something of a record. The apparent break in the white lines in the centre of the road is there because this is a composite of two pictures and two inconvenient cars parked in the foreground at the right side of the road were erased to improve continuity. Note the wheely bin  even though it was a bank holiday, the dustmen were active. 16. The old people's flats again. Another take of a classic scene. The lamp posts have gold stripes now. 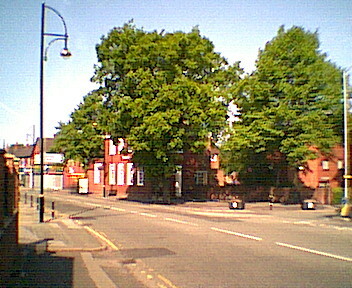 The large trees at the NatWest bank. 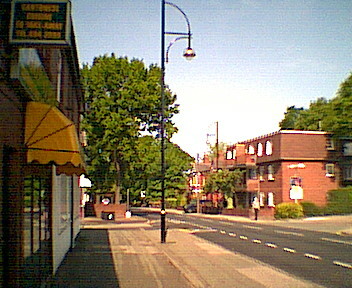 As Romiley Forum is on the south side of Compstall Road, it's a place of shadows, which the pen camera doesn't like. So this is composite picture of what's on the sunny side of the street.